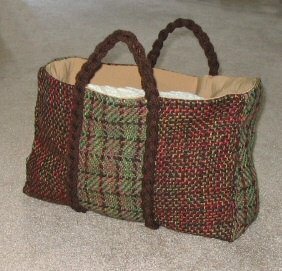 Now that I have the bag to carry it in, it is time to seriously work on planning my winter knitting project. Summer and its heat are for knitting socks. Winter and its cold are for knitting sweaters. My project this year will be my Rare Breed Sweater. I’ve been working on this idea for a long time. It first came to me in August 2002, when the Online Guild did its first rare breed challenge. The breed for that first challenge was Hebridean. As I worked with my 300 grams of fleece samples I wondered (as always), “But what can I do with it?? ?” Then I had one of those “light bulb” moments. I could use this sample, plus any rare breed samples I could get my hands on, in a motif featuring rare breed wools. Left to right: Cotswold, Lincoln Longwool, Tunis, Soay, North Ronaldsay, Shetland, Wensleydale, Navajo Churro, Jacob, Teeswater, Hebridean, White Faced Woodland, and Hog Island. The Hog Island was roving which had been dyed blue before it was given to me. 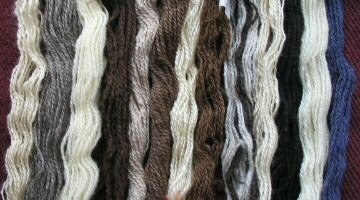 Of the North Ronaldsay and Navajo Churro, I have several colors to choose from. 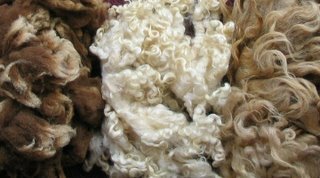 From the left, Manx Loghtan, Leicester Longwool, and Karakul are yet to be spun. This is good because it is still too hot to have a large wool project in one’s lap. After I finish the last of the spinning, I will have to do some serious swatching to explore design ideas I have been contemplating. The body of the sweater will be Ryeland, as I purchased a whole kilo of raw fleece and so have the most yarn in that breed. 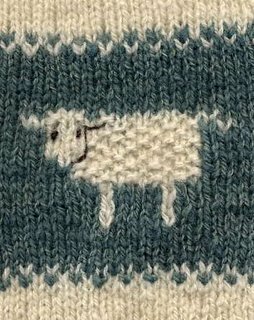 Each knitted sheep will be a different rare breed. I won’t pretend that this WKP (winter knitting project) will take only one winter. I knit for relaxation and pleasure (read I knit s-l-o-w-l-y) though I do usually manage to knit one sweater or vest each year. Even so, I am excited about finally getting to start the knitting part of this project. It’s been a long time coming. Sounds like a fun project. I have kind of a similar one. I have spun about 2,000 yards (plied) of a variegated deep red merino and am working on designing a Faroese shawl for it. Like yours, this will be a slow project! And probably not one for waiting in doctor's offices! This is so perfect - the bag was wonderful as a stand alone project - but now a sweater-in-progress to keep it company. You inspire me. What a great idea! Looking forward to pics of this creation in progress! I love the swatch. The project sounds like a wonderful idea. Is all of the yarn approximately the same weight? Yes, all the yarns are approximately the same (close enough anyway :) Since I got the idea early on in my rare breed spinning, I've been able to spin all my samples about the same size. I'm trying to do the same with all my silk samples (i.e. spin them about the same size), but that's another story! What a terrific idea ! I love all those colors. This will be an awesome sweater. Thanks for the kind comments about my dog coat ! What a beautiful collection of samples. 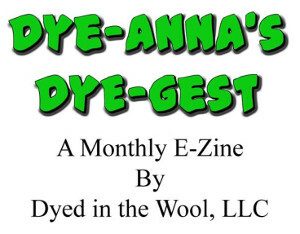 It sounds like a very interesting project and neat way to combine the variety of wools. Thank you very much for you sympathies too. It really helps. Also, that's quite an impressive collection of rare breed samples. Beautiful colours, and some of the names I hadn't even heard of before!